A yellow home interior brings sunny disposition and energy. Hence, it's great for those looking for add some cheer in their lives or a boost in confidence. One of the three primary colors (red and blue are the other two), yellow is probably the most eye-catching. As always with color, keep your yellow home interior relevant to the times to prevent it looking like an imposter from another era. If you're interested in the brighter tones, strong clean-lined geometric patterns lend themselves beautifully to yellow - the boldness of the shape works well in toning down the giddiness and movement that the eye associates with this color. The moral of this? If unsure, keep bright yellows as accents in a room. 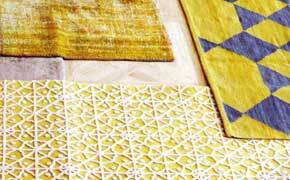 For example, as a cushion cover against a navy sofa or a yellow armchair against monochromatic interiors. If the space looks cold and dim, a yellow reflects the light making the space look brighter and pumps up the feeling of warmth. This is particularly true for tones of maize and mustard. Color that can bring its brightness down a notch or two such as gray and black to create a contemporary environment. The more muted shades combine well with plum and grape tones. If you've got mustard, pair it with chocolate for a touch of luxury and decadance. Then, there's dusty red and burnt orange which match with yellow to create an exotic flavour. The kitchen is ideal for yellow's perpetual optimism. The example below show how well the yellow door and furnishing light up the brooding gray kitchen walls. Note also how yellow adds a pop of color to the dark gray toilet walls? Touches in the lounge room will keep the space feeling alive. Playrooms too. 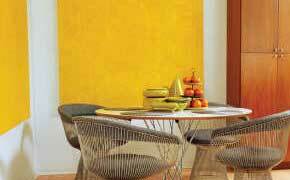 A dull shade of yellow such as mustard works well in restful rooms such as bedrooms.